The root cause of all anger is expectation or desire. Work on your desires than trying to control your anger! Whenever you get angry with someone, remember, you have caused that anger within you first. The target of your anger is outside of you – but the anger has risen within you. There is no point working on the target. Work on the source. Here’s a beautiful – and funny – Zen story to illustrate the point! Su Dongpo was an avid student of Buddhist teachings. He was quick-witted and humorous as a person and as a Zen Buddhism follower he was very committed and self-disciplined. He often discussed Buddhism with his good friend, Zen Master Fo Yin. The two lived across the river from one another. The “eight winds” in the poem referred to praise, ridicule, honor, disgrace, gain, loss, pleasure and misery – all forces of the material world that touch, stir and shake everyone. Su Dongpo was saying, through his poem, that he had attained a higher level of spirituality, where these forces no longer affect him. Impressed with himself, Su Dongpo sent an assistant to hand-carry this poem to Fo Yin. He was sure that his friend would be equally impressed. Filled with rage, he rushed out of his house and ordered a boat to ferry him to the other shore as quickly as possible. He wanted to find Fo Yin and demand an apology. This stopped Su Dongpo cold. He realized that Fo Yin had anticipated this hot-headed visit. Su Dongpo’s anger suddenly drained away as he understood his friend’s meaning. If he really was a man of spiritual refinement, completely unaffected by the eight winds, then how could he be so easily provoked? With a few strokes of the pen and minimal effort, Fo Yin showed that Su Dongpo was, in fact, not as spiritually evolved as he claimed to be. Ashamed, but wiser, Su Dongpo departed quietly. This event proved to be a turning point in Su Dongpo’s spiritual journey. From then on, he became a man of humility and equanimity, and not merely someone who boasted of possessing those virtues. Getting angry with something or someone is a futile exercise. Trying to control anger doesn’t work either. Because when you control anger, you are repressing it – which is why you are often not even “seeing”that you are angry, whenever you are angry! You are resisting a natural human response. And whatever you resist, persists. 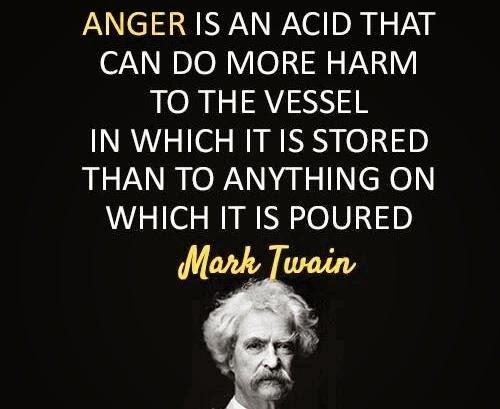 Instead, go to the root cause of your anger. And always, every single time, you will find that your anger is born out of your expectation, your desire. Just like Su Dongpo’s angry reaction came from his unmet expectation of receiving compliments from Fo Yin, each angry response by you, in any situation, comes from your desire. So, work on letting go of all expectations. Do your best, each time, and don’t set any conditions on the outcome of your efforts. Let whatever will happen, happen. In fact, whether you like it or not, whatever is due to happen will only happen. So, have this open mind, this awareness all the time. That way, when anger arises within you, as it naturally will when what you don’t like, want or expect happens to you, you will see how pointless it is to get angry. When you are able to “see” your anger as a wasted emotion, intelligent that you intrinsically are, you will soon cease to be angry!